American Graduate Champion and Miss Mississippi 2014 Jasmine Murray has always had big dreams for her future. She realized that in order to fulfill these dreams, it requires hard work and dedication. 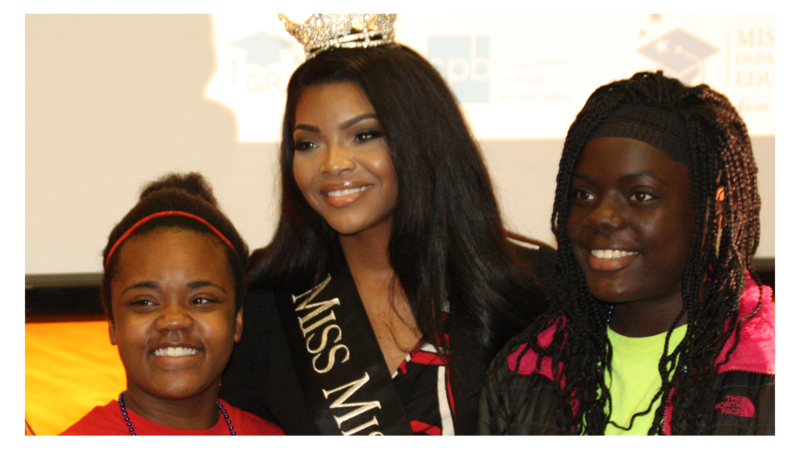 Jasmine Murray, Miss Mississippi 2014, helped Mississippi Public Broadcasting with its American Graduate Initiative. Jasmine worked with MPB and American Graduate to make a difference and motivate high school students to obtain their diploma. As spokesperson for American Graduate, Jasmine Murray toured three Mississippi High Schools. She spoke and sang with words of encouragement about staying in school and having goals. She also addressed the Stop the Drop 2014 Summit speaking to students and educators about her experiences setting goals and accomplishing dreams. MPB produced several interstitials with Murray including on called “Dreams” that shared Murray’s story about starting a child with dreams and making them become reality. Murray is a singer and beauty pageant titleholder from Starkville, Mississippi. She is the youngest of five children. She was born in Columbus, Mississippi and attended Columbus High School. Her family later moved to Starkville. She competed in the Miss America’s Outstanding Teen scholarship pageant and was a student at Mississippi School for the Arts. She is also known for being a finalist on the eighth season of American Idol. Murray’s platform as Miss Mississippi was “13 going on 30” which was focused on reaching young girls with messages about how to stand up for themselves and how to deal with peer pressure. Having been bullied in school, Murray understands the difficulty of standing up for yourself. Thorough her organization 13goingon30.org, she is reaching hundreds of young girls about setting big goals for themselves. She has motivational camps and public speaking tours that allow her to mentor. I was bullied in school to the point of being beat up on the playground. I didn’t quite know how to stand up for myself. I want others to understand and be educated so that they are not victims of bullying and so they won’t make unwise decisions because of it. Ever since I can remember, I wanted to sing. I would have dreams where I could see myself being on stage in front of thousands of people. I knew then that was what I was supposed to be. My gift is more than for me to just imagine but to become. I immersed myself in my dreams. I realized that education is the center of my success. I invested in my education. Making sure that my education came before everything else. Education is essential to success. Oh it hasn’t been easy. It’s been a long and hard road. There were times I even broke down. The truth is I am a work in progress. Constantly being refined. True is anything worth having is worth hard work, consistency. So today, I am grateful that I didn’t give up, for those who are behind me and believed in me sometimes more than I believed in myself, and for pushing myself to be better each day. I am Jasmine Murray. I am in pursuit of my passion.